Semi hard cover case providing total front-and-back coverage thus offering double protection to the body and screen of your smartphone. The two parts this cover case is made of fit together perfectly. 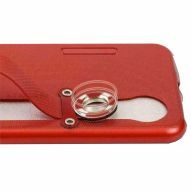 The semi hard front case and the soft, form-fitting back case are available in different colours. Case and screen protector within a single protection to guarantee the best security when you use all the features of the smartphone.